What do I do if I Find a Baby Pigeon? Inflatable bird scaring products to help rid pigeons and other birds are becoming a more common sight in both agricultural and urban environments. 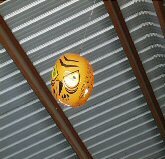 ‘Terror Eyes’ is a predator balloon which is inflated via either foot or electric pump and once inflated, ‘Terror Eyes’ is installed on a pole or hung from a vantage point overlooking the area to be protected. ‘Terror Eyes’ will then be in the correct position to have the maximum impact on the pest species of bird concerned. 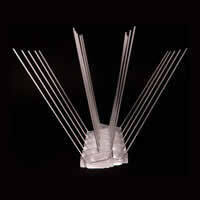 ‘Terror Eyes’ is suspended by an optional spring, helping to ensure that the balloon moves erratically, and this, combined with movement of air currents, further gives the impression that this is a ‘live bird’ rather than a static device. ‘Terror Eyes’ is made from heavy duty vinyl and provided in brilliant colours for maximum impact. ‘Terror Eyes’ is a 2-foot diameter hanging sphere with lenticular eyes emblazoned across the front and back of the balloon, creating a holographic effect. The principle is that as a pest species of bird approaches the ‘Terror Eyes’ balloon the lenticular eyes will follow the bird, moving and changing all the time and, according to the distributor, will "strike fear in the birds". ‘Terror Eyes’ is designed to rid pigeons and many different species of bird including sparrows, starlings, gulls woodpeckers, swallows, crows, blackbirds, geese and more. The distributor also confirms that ‘Terror Eyes’ is "..scientifically designed from extensive experience and research on predator and bird behavior." ‘Terror Eyes’ is recommended for use in a variety of different situations including airports, granaries, car parks, motorway and bridge underpasses, building roofs, marinas, gardens, vineyards and many other agricultural environments. The distributor also claims that the product is used by NASA. ‘Terror Eyes’ is harmless to birds and is simply designed to move pest species of birds from one area to another. Millions of units have been sold worldwide and the distributor claims that ‘Terror Eyes’ is currently the most affordable pigeon control product available within the pest control marketplace. The Department of the Environment, Food and Rural Affairs (DEFRA) is the UK’s Government body that oversees the Wildlife and Countryside Act and produces legislation to which the pest control industry must adhere. The following information is taken from a document provided on DEFRA website entitled: ‘Review of international research regarding the effectiveness of auditory bird scaring techniques and potential alternatives’. By J Bishop, H McKay, D Parrott and J Allan. "Balloons tethered in a crop are an inexpensive method of bird deterrence, but studies show that they are not very effective and birds quickly habituate to them." "To increase the effectiveness of balloons, eyespots, consisting of a circular pattern that resemble the appearance of vertebrate eyes, can be printed on the side." 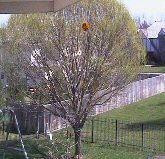 "Although easy to set up and move around, balloons can be easily damaged in high winds and can deteriorate in sunlight leading to a loss of helium and thus height. 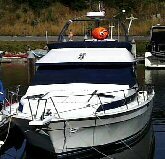 They also need to be regularly checked to ensure that they do not break free from their moorings and present a hazard to aircraft. In the UK, the flying of balloons is governed by the Air Navigation Order, which states that without the written permission of the Civil Aviation Authority, a tethered balloon cannot be flown above a height of 60 metres or within 5 kilometres of an aerodrome (CAA 2002). Their effectiveness at ridding pigeons and other birds appears to be dependent on the species concerned and the effects are only short term." 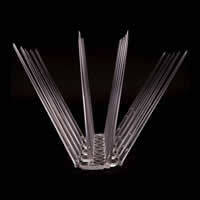 ‘Terror Eyes’ is currently available in the UK at a cost of approximately £50.00 including VAT. 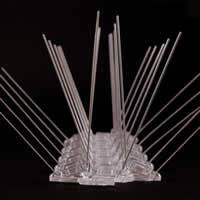 There are a variety of balloon-based holographic products available in the pest control marketplace ranging from as little £10 through to several hundred pounds. Although ‘Terror Eyes’ is relatively inexpensive to buy it should not be chosen for this reason alone. Many bird scaring products and deterrents designed to rid pigeons cost very little to purchase but have little or no effect on the target species concerned. "It's always been a battle for us to repel the birds," said James Reeves, building maintenance supervisor. "The Frito Lay manufacturing plant here in Cucamonga is right next to a regional park which makes the bird problems a lot tougher for us. Hundreds of crows, sparrows, starlings and sea gulls would gather around our product waste area where there was food lying around. Our hands were tied but we had to find a solution because of the tight inspection policies within the food processing industry," Reeves explained. Frito-Lay finally found its solution to the bird problems from a local distributor of bird repellant products. "We were trying to get an ultrasound bird repeller device at the time. 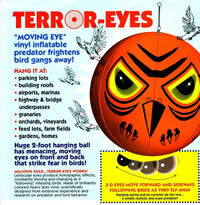 Our distributor suggested that we try a Terror-Eyes balloon," said Joe Becerra, plant sanitarian. These two-foot-in-diameter balloons contain two sets of holographic eyes that appear to move. "At first, we thought it was a joke," Becerra said. "But since I desperately needed help, I thought it couldn't hurt to give it a try. Besides, we had previously used a Bird-X product called Nixalite, which helped us to successfully eliminate roosting areas. The only limitation was that we couldn't place Nixalite everywhere we wanted because of safety reasons, so we tried Terror-Eyes." Once he saw how Terror-Eyes really worked, he took it very seriously. 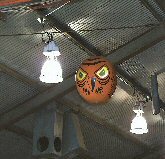 Becerra said that he initially purchased two of the $45 units and sporadically placed them in locations where he could "scare the birds off." And he had amazing results. "I would say that Terror-Eyes has helped to reduce bird problems here by about 90%," Becerra said. "Because this was the most effective solution we've tried, I ordered nine additional units. Whereas before we installed Terror-Eyes, hundreds of birds flocked here to fight over a popcorn kernel, maybe only a few birds can now be seen in the area because they seem afraid of the Terror-Eyes balloons." ‘Terror Eyes’ are made in Japan and sold by an American company based in Chicago. Company President Richard Seid confirmed that there are now approximately 6,500-7,000 of the devices in operation throughout the U.S. and over 1 million have been sold in Japan. "The main distinction between Terror-Eyes and our competition is that Terror-Eyes is manufactured with holographic lenses set inside the eyes of the balloon which resembles an owl. Since the owl is naturally a predator to the problem birds, the birds are afraid of the balloons and will stay away." ‘Terror Eyes’ clearly has some value as a bird scaring device but it is unlikely to resolve entrenched bird-related problems as a stand-alone product. 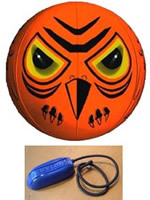 Provided in conjunction with tried and tested products such as the anti-roosting spike, however, the ‘Terror Eyes’ predator balloon may play a valid role as part of an overall control system. ‘Terror Eyes’ is designed to be effective in a number of environments and therefore must be both versatile and robust in order to be effective in the medium to long term. Any device that is powered by wind and provided at height must be strong enough to withstand extreme weather conditions. This is because it may not always be easy or even possible to remove the device when extreme weather is forecast. If ‘Terror Eyes’ is provided on a roof or any other area at height, access to the device may not only be difficult but also expensive. Access equipment such as vertical lifts (cherry pickers) can be extremely expensive to hire. These factors should always be taken into consideration when choosing a wind-based deterrent that is provided at height. DEFRA’s view on the predator balloon suggests that the product is largely unsuccessful as a general bird scaring device based mainly on the fact that birds quickly habituate to the product and its benefits are, at best, only short-term. Although DEFRA considers the product to be easy to set up and move from one site to another, the problems inherent with loss of pressure as a result of direct sunlight, and degradation in high winds, is a real concern. Those considering the product should also be aware of the limitations in respect of flying a balloon close to an airport and indeed the legal implications should a balloon tear away from its moorings in high winds. ‘Terror Eyes’ will have to be installed in such a way that it has space to move and rotate and therefore choosing the correct site is extremely important. If the initial installation site proves to be inappropriate for any reason, the cost of moving the device may be considerable. ‘Terror Eyes’ will need to be installed in a situation where it can either be suspended from above or attached to a dedicated pole, usually by a spring. The distributor suggests that the device will need to be anchored via a loop on the base of the unit, as well as by the fixing point on the top of the unit, in areas where high winds may be an issue, ie. on the roof of a building. This installation criterion requires that a specific site is chosen where the unit can be suspended both from above and below the unit. This may cause logistical problems based on identifying good anchor points for ‘Terror Eyes’. It should normally be possible to identify good fixing points above the unit so that the unit ‘hangs’ correctly, but identifying similar fixing points below the unit may be problematic. If a pole is considered as a means of anchoring the device the cost and time involved with installation of the pole must also be taken into consideration. The distributor also suggests that ‘Terror Eyes’ should be moved from time to time as birds will quickly become used to its presence. As with re-installing the device due to extreme weather conditions or for any other logistical reason, the cost of relocating ‘Terror Eyes’ must be taken into consideration when making the final decision to purchase the unit. PDF on DEFRA website entitled: ‘Review of international research regarding the effectiveness of auditory bird scaring techniques and potential alternatives’. By J Bishop, H McKay, D Parrott and J Allan.